A traffic management change was put in place on Sunday the 21st of October overnight. This is planned to be in place until the end of February 2019. The change was put in place to enable District Heating Main works, utilities diversions and the next phase of construction for the final scheme (including footway and carriageway construction). We are sorry for any inconvenience caused and will update you if there are any confirmed changes to the current programme. Work on the Temple Gate scheme will run from 26 June 2017 until Autumn 2019. The associated construction work will result in changes to how pedestrians, cyclists and motor vehicles travel through the area. Plot 6/Brunel Mile pedestrian crossing has been closed to construct a new section of road. This is due to reopen in February 2019. District Heating Main (DHM) works on Redcliffe Mead Lane are now complete. However, the closure will remain in place until February 2019 to allow other works to be completed. Clarence Road lane 2 and pedestrian crossing are closed and due to re-open in February 2019. The traffic running around the Temple Gate roundabout has been shifted to the outside lanes (with no loss of roundabout capacity). This change is clearly marked on site. 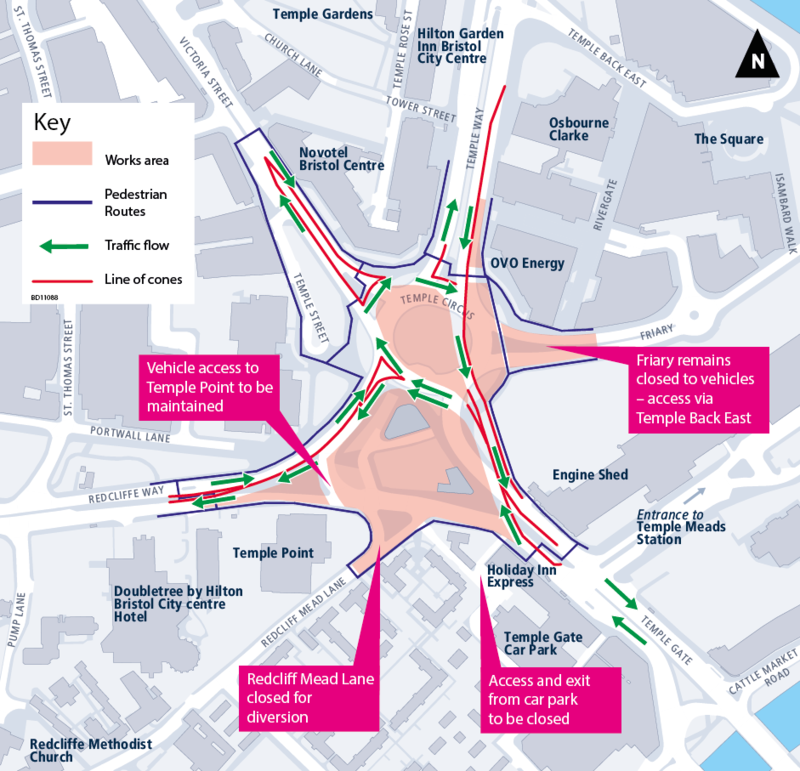 Closure of the south side of the Temple Circus roundabout to simplify traffic movements during the works. Traffic from the north will no longer be able to turn right into Victoria St from Temple Way and traffic exiting from the Friary will no longer be able to turn right onto Temple Way or straight on to Victoria Street. During these weekends buses will replace trains between Bristol Temple Meads and Bristol Parkway, as well as between Bristol Temple Meads and Severn Beach.